Newcomer Family Obituaries - Kyoko Lockwood 1943 - 2019 - Newcomer Cremations, Funerals & Receptions. Kyoko Lockwood, age 75 of Huber Heights, passed away Friday, January 11, 2019 at her daughter's home, surrounded by her family. She was born October 20, 1943 in Gushikawa, Okinawa, the daughter of the late Sosei and Fumi Chinen. Kyoko is survived by her husband of nearly 51 years, James; children, Mutsuko Caraulia, Pamela E. Armstrong, Sherry L. Ewen, Sueko L. Gibson, James Ralph Lockwood, III, Sheilene T. Kozlowski; 12 grandchildren, Shannon Valdez, Aaron Caraulia, Brittany Franklin, Mark Armstrong, Mycol Armstrong, Kaylee Ewen, Nicole Ewen, Emily Ewen, Brendan Gibson, Sidney Gibson-Lockwood, Carson Gibson-Lockwood, Charlotte Kozlowski; 7 great-grandchildren; 5 siblings, Soichi Chinen, Toshiko Griffith, Keiko May, Hideo Chinen, Kiyomi Nagamine; as well as numerous nieces, nephews and many friends. Visitation will be held on Saturday, January 26, 2019 from 3 pm to 4 pm at Newcomer North Chapel (4104 Needmore Rd., Dayton, Ohio 45424). A Memorial Service will begin at 4 pm. Private interment will take place at Dayton National Cemetery. To share a memory of Kyoko or leave a special message for her family, please click the "Share Memories" button above. Add your memories to the guest book of Kyoko Lockwood. 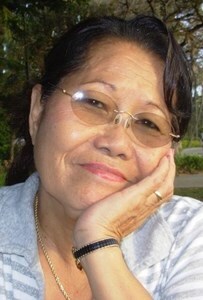 Kyoko was one of the most loving and giving woman I ever met. The love she had for her husband and family radiated from her face and smiles. She will be greatly missed and our prayers go to her family during their loss of such a wonderful wife, mother, and grandmother. I would like to express my sincere condolences for your family's loss. Losing a loved one in death is one of the hardest things anyone has to experience. However, this pain and grief is not something our loving God ever wanted for us. We can be assured that during such difficult times we are not alone. The Bible promises that God "is close to the brokenhearted; He saves those crushed in spirit" (Psalm 34:18). I hope that knowing you have someone so powerful by your side, at times like this, brings you great peace of mind and comfort. I dont think there is ever a day that goes by that I do not think about my Lockwood family... all of them... I LOVE YOU ALL... R.I.P A. KYOKO!